Livia, representing the TopDon company based in China, contacted me offering this free sample in exchange for an honest evaluation of their product. I am in no way affiliated with TopDon, nor do I have any investment in this company, other than my interest in testing this product. I will strive to be as fair and accurate as possible in the following review. The product arrived in good shape and was packaged in standard clamshell attire, but thankfully wasn’t sonic-welded shut. As with other similar test devices of this price range, the unit did not come with a storage case or pouch, but a suitable one can be acquired for a few dollars at many retail stores. The unit is lightweight, fits in your hand comfortably, and has an easy-to-read 2.4” B&W TFT display. The cables are heavy gauge, yet flexible and the post clamps are copper clad to resist corrosion. The unit supports six (6) languages, ten (10) battery testing standards, and four (4) specific automotive battery types. This unit will detect bad cells and will test batteries that are not fully charged. The ArtiBattery 101 has reverse polarity protection, so there is no worry about damaging the unit by inadvertently connecting it backward. The unit supports testing automotive type batteries of voltages ranging from 8 to 16VDC. In addition, you can test batteries either in or out of the vehicle. Of course, cranking or charging tests have to be performed with the battery in the vehicle. Couldn’t be simpler! Just connect to your battery (in or out of vehicle) and it turns on. It asks a few questions like language, battery type and CCA rating. It will tell you within a few seconds the condition of your battery and current voltage. I had an old battery on the bench and it correctly suggested replacement. This test, of course, requires the battery be installed in the vehicle. Once connected, it goes through the battery test first (as described above), then prompts you to start the vehicle. Once running, it will display the results of the cranking test. This would be useful in identifying a dragging starter, for example. After the cranking test has displayed its results, you then can test the charging system. You have a choice between loaded or unloaded charging system. It appears that selecting loaded will present results for both charging states as it starts the test unloaded, then you stress the system by turning on the headlights to apply the load, so you get more complete results in this manner. Overall, this little tester brings a lot of functionality to the DIY garage mechanic. It could easily prevent you from replacing the battery when in reality, you have a dragging starter or failing alternator. It definitely could save you time, money, and frustration easily and inexpensively. Although the manual doesn’t mention anything about updating the unit, there is a mini USB port on the bottom that could possibly be used for updating the firmware to add features, bug fixes or new battery types. I checked their website and found no evidence of updates for the unit there, but being a new product, that doesn’t surprise me. For other TopDon test devices, registration (which is free) on the TopDon website is required to obtain updates. The unit comes with a standard limited one-year warranty against defects in materials and workmanship. The company website, http://www.topdon.com, is fast, well laid out and includes product offerings, product information as well as updates and software to support your chosen device. 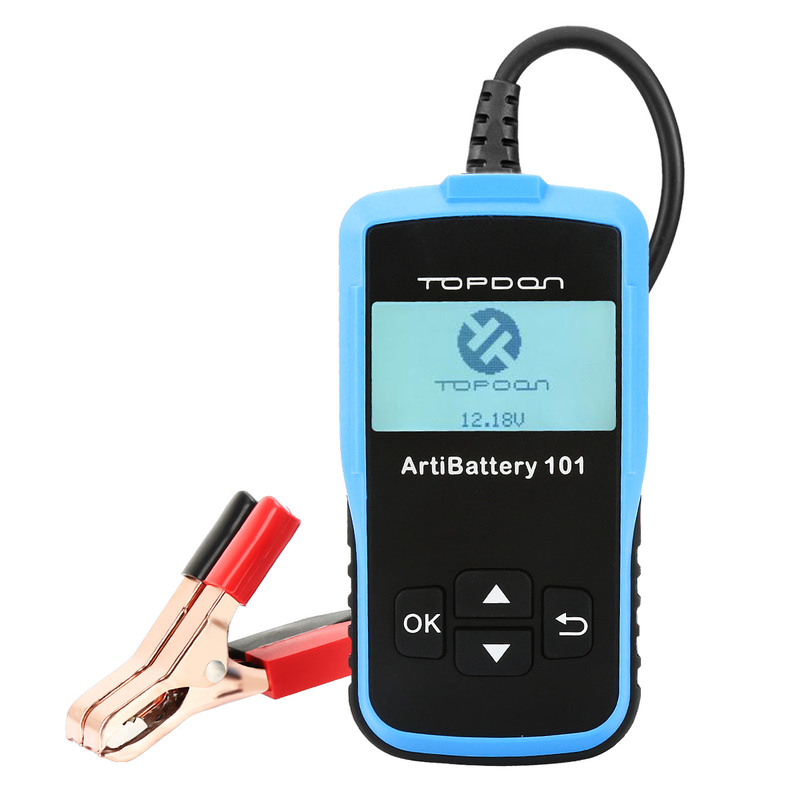 Based upon the copyright notice on their website, the TopDon company has been around since 2004 and have been designing and manufacturing quality electronic tools for the automotive venue. This unit is very useful, well-built and easy to use. The $54.99 Amazon price is fair and reasonable for a tool of this caliber. The functionality is right in line with other tools of this type and price range or higher, making this a good choice for the more serious home auto mechanic or DIY’er.